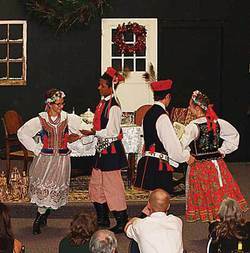 Members of the Edmonton based Mazur Group provided entertainment for the Polish Christmas fundraiser event held at the Warburg Cultural Centre. &#160; &#160; &#160; &#160; &#160; &#160; &#160;&#160; &#160;Go ahead Helen did! &#160;Thanks to the dedication of Helen, WCS President Linda McLaughlin and other WCS volunteers, 120 guests at the WCS Christmas Gala on November 30, 2013 experienced a heart-warming traditional Polish Christmas&#8212;complete with oplatek and an upside-down Christmas tree in the entryway, a fabulous meal and entertainment by ten members of Edmonton&#8217;s Mazur group who inspired the crowd with traditional Polish entertainment&#8212;dances and singing. &#160; &#160; &#160; &#160; &#160;&#160; &#160;On December 6 Santa visits the children. The big event is Christmas Eve or Wigilia, which means vigil. In many homes, the table includes an extra place setting&#8212;for Baby Jesus, unexpected guests or for honoring departed family members. Hay or straw, representing baby Jesus in the manger, is first placed on the table, under the white tablecloth. It lies flat so you would not know it is there. &#160; &#160; &#160; &#160; &#160;&#160; &#160;Children are sent to watch for the first star to appear. When they see it, they happily announce, &#8220;It is here. The star is here!&#8221; This represents the star that led the Magi to Jesus and signals the start of the meal. &#160; &#160; &#160; &#160; &#160;&#160; &#160;There is no cooking on Christmas Day&#8212;only reheating. &#160;It&#8217;s the day for enjoying visits with extended family. &#160;The day after Christmas Day is for entertaining family, friends and neighbours.